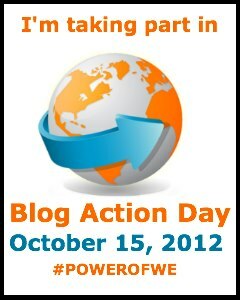 Blog Action Day is an free annual event, that has run since 2007. It’s aim is to unite the world’s bloggers by posting about the same issue on the same day, in order to raise awareness and trigger a global discussion around an important issue that impacts us all. Blog Action Day is a free event for bloggers, social media users, vloggers, podcasters, designers, infographic and data producers. The Power of We is a celebration!!! Η δύναμη όλων μας βρίσκεται στο να πιστέψουμε στη δύναμή μας. Written by SilentSoul at 10:05 π.μ.